In dramatic contrast to the die-cast metal body, two symmetrical reveals cut from a solid piece of optically pure acrylic adorn the top and bottom of the Voto wall sconce by Tech Lighting. Beautiful LED light pours from the top and bottom of the thick-cut acrylic to provide ample illumination. Voto outdoor wall sconces are also available with downlight or uplight only to meet the needs of all outdoor applications and Dark Sky considerations. 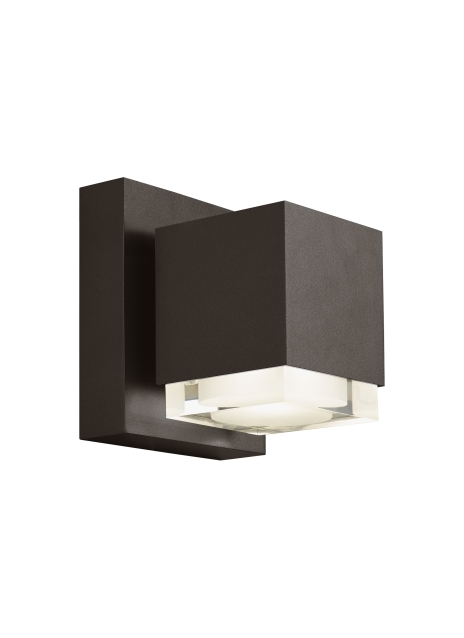 Ideal for residential, hospitality, or commercial applications, the contemporary Voto sconce design is available in two sizes (6 inches or 8 inches tall). This unique outdoor light fixture features a durable, marine grade powder coat finish available in either Charcoal or Bronze. Voto wall scones feature stainless steel hardware and impact-resistant, UV stabilized clear acrylic lensing for added durability and stability. Three options. up and down light, uplight OR down light only. compact size ideal for both indoor and outdoor use.